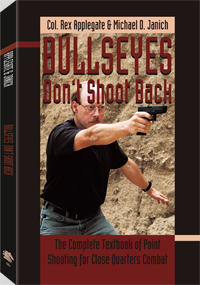 120 pages, 5.5" x 8.5"
Learn why point shooting is the most practical technique for aiming and shooting a handgun in a real gunfight. This instructional guide teaches you how and when to use point shooting, compares it to two-handed sighted fire and tells how a major police training facility is teaching point shooting with stunning results. Michael D. Janich is one of the foremost modern authorities on handgun point shooting and one of the few contemporary instructors to have personally trained with the late close-combat legend Col. Rex Applegate. In addition to making his own martial arts equipment, noted martial arts author and instructor Michael Janich has designed and engineered everything from blowguns to knives, including the highly acclaimed Masters of Defense Tempest folding knife.